Located on the banks of the beautiful West Lake in Hangzhou, Zhejiang province, China, Zhejiang University (ZJU) is one of the finest universities in China. On the afternoon of Feb. 18, 2012, more than 100 Zhejiang University (ZJU) alumni and their relatives attended the ZJU Alumni Association – Boston 2012 Chinese New Year Festival at Cambridge Center for Chinese Culture in Waltham, MA. After sharing delicious dinner, participants listened to several alumni vivid memories of their alma mater and their experiences living in Boston. 89-year-old alumnae, Shugai Zhang, recollected the years of ZJU moving westward when Japan invaded China during World War II, which sparked a strong sense of pride among attendees. 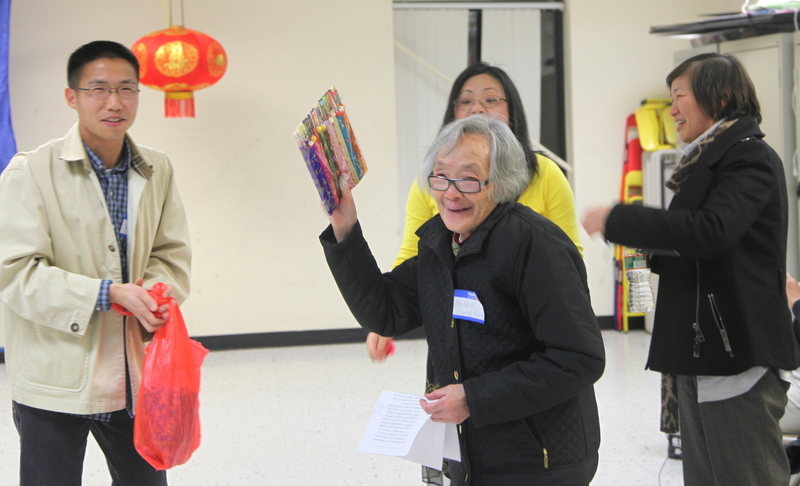 The New Year Festival was hosted by vice president of ZJUAA-Boston Ms. Jihong (Joan) Ni. In his opening remarks, ZJUAA-Boston President Baoming Hong said “This New Year Festival aimed at not only providing a broad platform for ZJU alumni to communicate and cooperate, but also promoting understanding and friendship.” He also encouraged all the audience to visit ZJUAA-Boston’s website to keep informed of new activities (www.zjuaa-boston.org). Dr. Xiaoming Zhang, Chairman of the 128 Chinese Union of Technology Enterprises (128Cute), enrolled in ZJU in 1978 as a Mechanics major. Dr. Zhang had just come back from China two weeks ago. He also shared his experience during Chinese New Year in Hangzhou. He said “The noise of firecrackers was incredible, and the festal mood impressed me a lot. Like an old saying ‘When I recall Jiangnan, I miss West Lake the most; when I recall West Lake, I miss ZJU the most’ ” Xiaoming Zhang had swimmed across Qiantang River when he was a student at ZJU. This time when he was in Hangzhou, he rode a bicycle around the West Lake to enjoy the scenery. He said that it took him two hours to circle West Lake because of the busy streets. Shugai Zhang came to the Chinese New Year Festival accompanied by her daughter Hong Shao. She said “In 1944, I was admitted to the department of pharmacy, college of science, and I studied at Meitan, Guizhou. Although under harsh war-time conditions, students kept ZJU’s motto of Seeking Truth. When we synthesized DDT in chemistry laboratory, each one of the students had a set of experiment equipment to draw cytological map. Joseph Needham, the famous scholar of Britain, visited Meitan and was deeply impressed by the hardworking students. He praised ZJU as Cambridge of the East”. Coincidentally, Shugai Zhang was the first winner of the lottery that evening. Other speakers included Yingyin Zou(founder of Boston Applied Science and Technology Company, admitted to department of Information Science and Electronic Engineering in 1980), Liqiang Dou(President-Elect of Sino-American Pharmaceutical Association – New England, admitted to department of medical science in 1986), and Haifei Zhang(Former President of Harvard CSSA, investment associate of Zhen Fund). Jihong (Joan) Ni, Yingyin Zou, Wenhua Jiang and Hang Chen sponsored for the Chinese New Year Festival. President Baoming Hong had a strong accent of Taizhou city, Zhejiang. It was immediately recognized by his fellow townswoman Qiebing Ruan, a student of St.John’s University in New York. Qiebing Ruan’s father also graduated from Zhejiang University, and Qiebing came all the way from New York for this festival to meet other alumni. She also performed Yueju Opera—-Bridal Chamber. Her elegant aria, graceful performance won her warm applause from the audience. The festival lasted four hours, and finally finished in laughter and happiness.